As Pope Francis touched down on U.S. soil yesterday, Washington also prepared for key visits between President Obama and the leaders of China and India, all focused heavily on climate change and the negotiation of a new international agreement. At least a half-dozen key countries are expected this week to announce new greenhouse gas emissions targets that will make up the spine of the new accord that could be reached in Paris in December. Those plans -- likely from India, Brazil, South Africa and a number of Latin American countries -- are to be unveiled by the U.N. General Assembly opening in New York this weekend. India's is the most hotly anticipated. Several analysts said yesterday that there is almost no chance India will propose a year by which its carbon pollution will peak -- as China has done -- but there are several signs that the government will boost its already-ambitious renewable energy target. 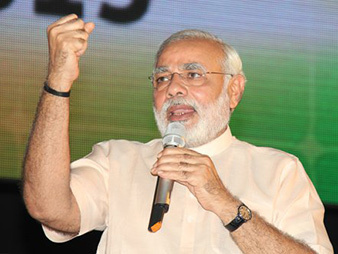 Narendra Modi, premier of India. Photo courtesy of Flickr. Speaking at the opening of the U.S.-India Strategic and Commercial Dialogue yesterday, Secretary of State John Kerry praised Prime Minister Narendra Modi's current goal of expanding solar power to 100 gigawatts by 2022. "I want to express support for Prime Minister Modi's plan to help India's economy become more reliant on renewable sources of power. And it is absolutely critical in the end on pure economic terms, but it's also smart politically, because a recent survey reported that 73 percent of Indians view climate change as the most pressing global concern," Kerry said. U.N. climate chief Christiana Figueres, who was in New York ahead of the General Assembly meeting, noted that India's formal plan is not yet official but offered early praise. "What we hear is that they are actually making a huge, huge step forward with respect to their ambitions of renewable energy target within their mix," Figueres said. "They're stepping up to 40 percent renewable energy. That means 350 gigawatts of renewable energy, mostly solar and wind, in their energy mix by 2030. That is a sizable step," she said. Analysts and environmental activists also offered cautious high marks. Neil Bhatiya, a policy associate at the Century Foundation, said reports of a higher renewables target, along with a reported heftier import tax on fossil fuels, are a "fairly ambitious proposal, given India's economic circumstances and efforts to rapidly reduce poverty." Anjali Jaiswal, who directs the Natural Resources Defense Council's India program, said she expects to see the government double the 20 to 25 percent below 2005 energy intensity target it offered up at the 2009 climate summit in Copenhagen, Denmark. An anticipated long-term emissions intensity target of 40 to 45 percent, she said, means India's emissions would grow three times as high from 2005 levels, but its economy would grow sevenfold. "So it's a significant step," she said. Jake Schmidt, director of international programs at NRDC, also praised India and other major developing countries for stepping forward to cut carbon alongside the United States and other industrialized nations. He said the collective planned carbon cuts will make a serious dent in rising emissions but also acknowledged they won't add up to enough to avoid a dangerous rise in global temperatures. "We won't be done in Paris, but we'll lay the foundation for a strong international effort on climate change," he said. White House officials said helping to lay that foundation is also going to be a key element of Obama's meeting with Chinese President Xi Jinping on Friday. 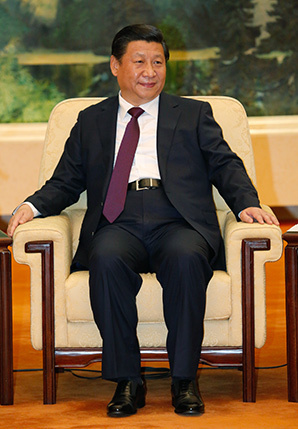 Xi Jinping, the president of China. Photo by Anderson Riedel, courtesy of Flickr. "The climate commitment that came out of last year's state visit is a direct indication of how sustained engagement can yield results in which the U.S. and China, again, are cooperating not just bilaterally but setting an example and helping provide momentum to global effort," White House deputy national security adviser Ben Rhodes said in a call with reporters. "The U.S.-China cooperation on climate change, which will be a focus of this summit, as well, is absolutely essential to achieving an ambitious agreement in Paris, when the nations of the world will come together to try to deal with climate change," Rhodes said. "As the two biggest emitters, our ability to work together is what unlocks the possibility of reaching that type of agreement." Schmidt said he hopes to see Obama and Xi make progress on making their respective targets a reality. The United States has pledged to cut carbon 26 to 28 percent below 2005 levels by 2025, while China has vowed to peak emissions by 2030. "There's only so many times you can agree to big peak targets, so I don't expect anything will have that same headline," he said of this week's meeting. But, Schmidt said, "I think what those two countries have to do is continue to both show each other and the world that they're actually doing things at home to reduce emissions." French Ambassador for Climate Change Laurence Tubiana said she sees Paris as a tipping point for global climate action. "It's a starting line," she said.